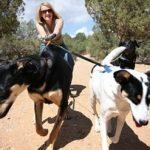 For many people who live in San Diego, their favorite option to exercise their dog is to head to the local dog park where they can watch their dog run free and burn off some steam. However, just getting there is not always a pleasant experience. Let’s see if this scenario sounds familiar – as soon as you get home from work, you say hello to your dog, who has been alone all day long, maybe you change your clothes, and then you start to gather your stuff to head to the dog park. Your dog sees you grab your “dog park” shoes and grab his leash. He starts to spin in circles, attack your shoes with pure enthusiasm, and bark and jump with joy. So, as fast as you can, you throw your shoes on, forgo putting your dog on leash, and just throw him in the car to head to the park. Your dog is SO eager about his adventure, he may still be spinning in the car, panting, or even whining and barking as you get closer to the park. All you are thinking is, “we are almost there, so the madness will stop.” All he is thinking is “we are almost there, I am crazy with excitement!” As soon as you arrive at the dog park, you wrestle with your dog to get him on leash before he dashes out of the car, and you begin the dreaded walk to the off-leash play area. At this point, your dog is having an “out of body experience” and is doing his best imitation of a perfect sled dog. You are already at the point of exhaustion because your dog has been barking in the car and you are both walking as fast as you can to reach that final destination of play. You arrive in one piece and your dog is off for a good romp with his friends. You are hearing the song “born free” in your head as you grab a seat in the park to watch the frolicking unfold. At some point, your dog returns to you exhausted and happy and you both head home. Many clients ask me how to make this trek an easier experience for them. The dog is having the time of their life, but we aren’t. The work actually begins before you even leave the house. With each step of preparation for the park, we may not realize it, but we are giving our dogs signals on how we want them to behave. With each behavior that our dog exhibits, our response to that behavior determines if it will continue. As we get our shoes on, and our dog is attacking our shoes, we are letting our dog know that if they attack our shoes, we will put on our shoes faster. If we grab their leash and they spin in circles, jump and bark, and then we head out the door; we are teaching them that if they act crazy, they get to leave the house. If they bark in the car and we continue to drive to the park, we are teaching them to bark in the car to go for fun car rides. Lastly, if we let them play sled dog to the dog park, again, we are teaching them that sled dog behavior equals off leash fun!! Our dog has learned that all these bad behaviors are reinforced and work because we continue to head to the dog park. We must break this chain of unwanted behaviors if we want to teach our dog proper manners. If your dog attacks your shoes as you put them on, stop moving, and watch and wait to see what your dog does. I bet he will stop too. When he does, give him lavish attention and maybe even offer a treat for calm behavior. Next step – the leash. If your dog goes crazy when you get their leash, again, stop moving, set the leash down on a table and stand quietly watching your dog. Once he is calm, praise him, then pick up his leash and try again. Silence is golden at this point, as dogs are visual learners and will cue off our body language quicker than our words. Continue this process with each new step you take to get to the park. Yes, it may initially take longer to get out the door, but we are teaching our dog that calm behavior is rewarded, crazy behavior makes all action stop. Just try it and see what happens!